Squeals on Wheels is the eighth level of Donkey Kong Country 3: Dixie Kong's Double Trouble! It is also the third area of Kremwood Forest. The name of the level may be derived from Meals on Wheels. This is the last Mill-themed level in the game. In this mill level, the Kongs encounter Sneeks, many of which are running around on large wheels. In order to open the doors in their path, Dixie and Kiddy Kong must take out all of the Sneeks that are on wheels by tossing Steel Kegs at them. After one of the foes are defeated, a small part of a meter found throughout the whole level turns green. Once the whole meter is green, one of the doors open and the meter resets. Defeating all of the Sneeks may require some additional exploring from the Kongs in order for them to continue. Strangely, the level's exit is right next to the beginning, however, the way is blocked. Therefore, they need to climb to the top of the mill to gain access to it. Parry makes his first appearance here near the end of the level to rack up a few extra items. Re-Koils, Buzzes, and a single Booty Bird can be found here as well to impend in the Kongs' progress. The Kongs begin the level on a flat pathway leading to a few bananas that hang along the ceiling and a Steel Keg that can be used to defeat a Sneek running on a small wheel. A Banana Bunch hovers above the mechanism. Once the Sneek is defeated, a meter on a nearby pole fills up, causing a nearby door to open and allow the primates to journey farther. The apes find a DK Barrel ahead of them after they reach the other side of the door. A Sneek and a rope are located near the barrel, and another door is placed to the right of them. The door cannot be opened until every Sneek in the level is defeated. If the heroes head to the top of the banana-covered rope, they reach a Banana Bunch and a solid area of ground with a Re-Koil on it. A wheel is suspended in the air nearby, and a Sneek runs along it, who can be defeated with a nearby Steel Keg. After they defeat it, a small section of a bar hanging on a pole turns green, indicating that the Kongs are closer to opening the next door, which is located farther ahead. Once the primates climb over a raised piece of ground with the letter K on it, they find another Steel Keg that can be used to defeat a Sneek on a wheel that is guarded by a red Buzz. A ledge is near here with a Re-Koil on top of it. 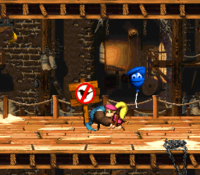 Using an elevator to the right of the bouncing enemy, the Kongs are able to reach a higher area of the mill, where they can find another Sneek on the wheel being protected by two red Buzzes. The foe can be defeated with the Steel Keg placed under it. As with the previous Sneeks, some of a nearby meter fills up when this Sneek is defeated. The heroes can find a few ledges nearby with a Re-Koil on the edge of one of them. The primates climb a rope located shortly before the Star Barrel. A platform with a Steel Keg on it is raised over the pathway ahead of the ledges. The Kongs can use the barrel to defeat another Sneek on a wheel, which is surrounded by a red Buzz. 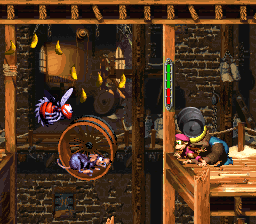 After the rat is defeated and the meter is filled, they can use the wheel to land on a high area of ground farther into the level, where a locked trapdoor and a Re-Koil are located. Once the apes pass a nearby Sneek, they can reach another raised piece of ground with a Steel Keg on it and the letter O above it. A rope hangs to the right of the letter O, while an additional room is located to the left of it. In this room, the Kongs can find elevator that is able to lift them to another Sneek-holding wheel. 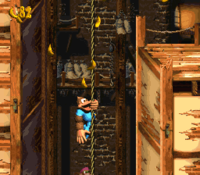 After they defeat the foe and fill some of the meter as a result, they can head back to the previously-mentioned rope to reach a higher part of the mill. Here, they can find a locked trapdoor with a Sneek on a wheel above it. The Sneek can be defeated with a nearby Steel Keg that stands next to a closed door. Once the primates beat this enemy, the closed door opens and the meter empties, if they have defeated the previous Sneeks on wheels as well. The level's Star Barrel and another Steel Keg are immediately after the door. The Steel Keg can be used to defeat two Sneeks ahead, who both run on wheels, which can be jumped on to reach a hidden area containing a Bonus Barrel. Ahead of the two wheels, the heroes can find a Re-Koil, another DK Barrel, and a lone Sneek that walks down a slanted platform. The Kongs can find an additional Steel Keg and an elevator ahead of here. The elevator can lift them to a Sneek on a wheel that is guarded by two red Buzzes. After they beat the enemy, the meter fills slightly. If the apes choose to progress from here, they ride to the top of the area with the elevator, where there is a solid piece of ground with a Steel Keg on it. The item can be used to defeat a Sneek on a wheel, which is orbited by a pair of green Buzzes. The letter N stands on a raised piece of ground nearby, which is followed by another Steel Keg and an additional raised area of the ground with two red Buzzes flying over it. The Kongs can carry the barrel past the Buzzes to be able to defeat another Sneek that runs on a wheel with it, who is placed nearby. After they defeat it, filling up some of the meter, they can head down a ledge with a trapdoor following it. After they drop down an additional ledge, they reach another Steel Keg that can be used to fight a Sneek on a wheel that is surrounded by a pair of red Buzzes. Once they defeat the foe, therefore filling the meter, that can head onto a higher part of the ground, where they can find a Sneek and an Auto Fire Barrel that can be used to blast them onto an elevator that moves in a horizontal path under a Sneek on a wheel. They can defeat it by using a Steel Barrel placed on a ledge to the right. They can progress farther into the level if they travel to the east, where they can find a rope with another Sneek on a wheel near the top of it. The wheel can be jumped on to reach a piece of ground ground with a Steel Keg on it. They can throw the barrel at the rat to defeat it, thus filling a small portion of the meter. After the two friends travel over a locked trapdoor, they encounter two Re-Koils hopping over a Banana Bunch. Nearby, they can find a Sneek on a wheel that is surrounded by a couple of red Buzzes. On a higher piece of the ground, they can find a Steel Keg that they can use to defeat the Sneek. An elevator moves to the right of the barrel that can aid the heroes in accessing a higher part of the mill. Here, they can find a Steel Keg and a closed door. The Kongs earn a blue Extra Life Balloon after successfully guiding Parry to the No Animal Sign. A Sneek on a small wheel is suspended above this area, and two red Buzzes circle it. Once the heroes defeat the rat, the nearby door opens, but only if the heroes are successful in filling the meter. On the other side of the door, the primates can find a trapdoor that they can break through to fall farther down into the mill. As they fall downwards, they crash through several trapdoors found previously in the level. After breaking through the final trapdoor, they land back near the beginning of the level, where a once-closed door is now open. On the other side of the door, they can find a long room with an Animal Crate containing Parry the Parallel Bird. They can use the animal to collect a long, straight line of bananas above them. The Animal Friend can also defeat a Booty Bird on the way, and once this foe is defeated, they are given the letter G. If the heroes travel farther ahead, they pass a Sneek and a red Buzz that flies high in the air. They must jump under it if they want to keep Parry from hitting it. A No Animal Sign follows the Buzz, and when it is passed, Parry disappears in exchange for a blue Extra Life Balloon. The Level Flag is ahead of here, and when the heroes raise it, the level is completed. K: After passing the second Sneek on a wheel, the Kongs approach a raised piece of ground with the letter K on it. O: The letter O stands on a raised piece of ground located next to the second rope in the level, which hangs shortly before the Star Barrel. N: The Kongs can find the letter N on another raised piece of ground after the fourth Sneek on a wheel from the Star Barrel. G: After the heroes reach Parry the Parallel Bird, they can lead it towards a Booty Bird that flies shortly before the Level Flag. When Parry hits into this enemy, it defeats the foe, causing the letter G to be given to the primates. After the letter O, the heroes ride up an elevator to meet a Sneek. They should jump on its wheel to reach a high ledge, where they can find a Bonus Barrel. It can take them to a Bonus Level, where they need to collect 20 stars within 20 seconds while jumping on wheels suspended in mid-air with a pair of Sneeks on them. Once all of the stars are collected, a Bonus Coin appears at the end of the area to claim with the remaining time. Right after the Star Barrel, the heroes meet two Sneeks on wheels. They should jump on their wheels to reach a ledge, where they can notice a Bonus Barrel. Jumping into the barrel takes them into a Bonus Level, where they, as in the previous Bonus Level, bounce around two wheels suspended in mid-air. However, instead of grabbing stars, they have to collect a total of 15 green bananas within 30 seconds. Once enough of the bananas are collected, a Bonus Coin appears to the right of them. The Kongs approach the level's DK Coin. Just before the letter N, the heroes can discover a Sneek on a wheel. They should jump on its wheel and use their Team-up move to reach a hidden area in the top-right corner of the screen, being cautious of any Buzzes around the area. Once this is done, the heroes meet a Koin with the level's DK Coin. Unfortunately, the foe does not give up the special item without a fight, so they have no choice but to use the nearby Steel Keg to attack. If they stand on the enemy's shield, the Koin puts his attention on the Kongs. At this time, the apes should throw the barrel at the nearest wall. The barrel can bounce back and hit the distracted Koin, defeating him as a result. This leaves the DK Coin for the Kongs. Immediately after passing through the first door, Kiddy must throw Dixie up into the corner of the room to access a Warp Barrel that takes both of them to the Level Flag. Dixie walks on a rolling barrel in the original version of the game. The primates lead Parry through some of the level. Kiddy prepares to throw a barrel at a Sneek in the Game Boy Advance version of the game. Dixie drops into a trapdoor. This page was last edited on April 10, 2019, at 13:24.